J im Luce has, in the thirty years he has spent in New York, lived in three Queens neighborhoods: Astoria (1990-91), Jackson Heights (1992), and Elmhurst (1993-1998). 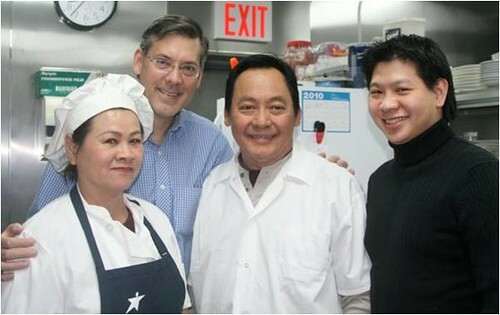 Jim Luce visits the kitchen with the owners and his friend Paat Sinsuwan. See Jim’s Pinterest album New York City. Trademarks are property of their respective owners. Articles, photographs and graphics by Jim Luce are © Jim Luce. Luce Publications™, The Jim Luce Stewardship Report™, The Stewardship Report™, JLSR™, The Luce Index™, JLSR Tidbits™, Thought Leaders & Global Citizens™, and JIM LUCE™ are all TM – SM of Jim Luce. Follow The Stewardship Report on Facebook.